Return to Force Structure and Unit History Branch main page. Lineage and honors information will only be posted to this site after a certificate or statement of service has been dispatched to the unit commander. Information posted should be considered current as of the posted date, although there may have been subsequent unit status changes, redesignations, or additional honors. This additional lineage information will be included the next time a certificate or statement of service is issued to the active unit. Lineage information will not be updated to show inactivations. Resources are not available to determine or post information for inactive units. Please do not request that lineage and honors information be prepared or updated for inactive units. The sequence of preparation and posting of new lineage and honors information is dependent on the workload and resources within the Force Structure and Unit History Branch. Although thousands of Army units have served our country, the branch's small staff has a large backlog of currently active units awaiting lineage and honors information. Requests for the posting of specific unit lineages cannot be accommodated at this time. Higher headquarters should not make requests for their subordinate units, since official certificates are legal documents furnished directly to unit commanders. Certificates are also considered accountable unit property and current lineages will not be replaced without another written request accounting for the loss. 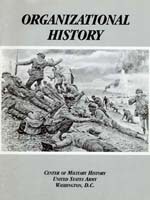 Unit Lineage and Honors information, except for armies, corps, divisions (including divisional brigades), and separate brigades, is posted below in subordinate directories based on the type of unit (branch or functional area). The Armor directory contains all of the entries for units in that basic branch; Signal the signal units, etc. Cavalry contains information on units with a cavalry designation no matter how they are organized (i.e., as ground reconnaissance, armor, infantry, or aviation). Other directories are self-evident from their titles. A Glossary of Lineage Terms appears in Appendix A of Organizational History. Lineages for combat arms battalions contain one special marking, commonly referred to as an earned honor device. Honors that are marked with an asterisk are those that were earned by the battalion or its predecessor. The campaign or decoration streamers displayed on the battalion's colors representing those earned honors carry a special embroidered laurel wreath (drawing courtesy of The Institute of Heraldry website) to distinguish them from honors shared by the regiment's elements based on having been earned by one of the other battalions. 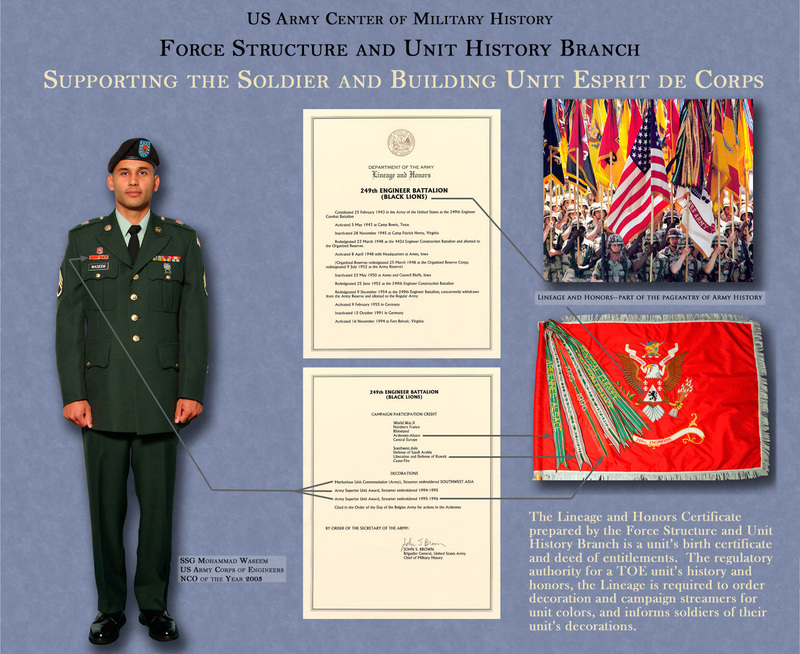 For additional information on the earned honor device, Lineage and Honors Certificates, and other aspects of the Army's Organizational History Program, see the Frequently Asked Questions in Appendix E of Organizational History. Click here for Printable Handout [PDF 159KB]. After approval and review, U.S. Army unit awards are officially confirmed in Department of the Army General Orders, but these are infrequently published for a limited audience and usually omit the award citations to save space. With the permission of the Awards and Decorations Branch, U.S. Army Human Resources Command (HRC), and as a courtesy to Army units, Soldiers, and veterans, CMH ONLINE is posting the HRC permanent orders which are usually issued to the decorated unit along with its decoration streamer, certificate and citation for newly authorized awards (not campaign credit). 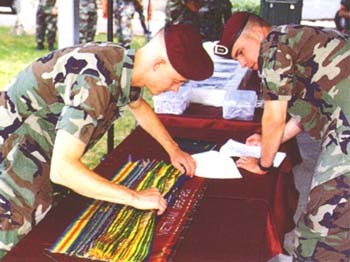 The orders contain in one document the key information on the type of award, the decorated unit(s), the recognized period of service, and the official citation summarizing the reason for the award. Orders will be posted as they are received from HRC, who remains responsible for their content. The Combat Arms Regimental System: Questions and Answers NOTE: The Combat Arms Regimental System has been replaced by the United States Army Regimental System. This study was prepared in 1978 and much of the information included has been superseded. The historical information on the decisions leading to the initial implementation of the Regimental System, however, remains valid. Information Paper on how official named campaigns have been determined for display on the Army flag and individual unit flags. An official Special Designation is a "nickname granted to a military organization" which has been authorized by the Center of Military History and recognized through a certificate signed by the Chief of Military History. Once approved, these designations may only be used by the officially recognized unit. Special Designations appear on the list in capital letters. Unofficial designations are also not included. For example, the 1st Cavalry often uses "Black Hawk," but officially adopted 1st REGIMENT OF DRAGOONS. The 4th Armored Division is sometimes called the "Breakthrough Division, but the division never officially pursued the designation, preferring to be "known by its deeds alone." In most cases, only units authorized an organizational color, distinguishing flag, or guidon (excluding organic elements of color-bearing organizations) are entitled to special designations. Units wishing official recognition of special designations need to send written requests on unit letterhead to the Commander, U.S. Army Center of Military History, ATTN: AAMH-FPO, 102 4TH AVE BLDG 35, FORT MCNAIR DC 20319-5060. Please include the reason for your selection with a brief	statement of why the designation has meaning to the unit. Once approved, a certificate signed by the Chief of Military History,	attesting to your unit's selection will be forwarded upon completion. Special designations will also appear on any new Lineage and Honors Certificates issued to unit, and will be added to the listing of official special designations posted on CMH ONLINE. NOTE: There is often confusion between a motto and a special designation, but the former is a heraldic item controlled by The Institute of Heraldry, while the latter is usually a unit "nickname." For example, the 3d Infantry's special designation as THE OLD GUARD, stems from General Winfield Scott's description of the unit as The Old Guard of the Army. The regiment's motto is NOLI ME TANGERE (Do Not Touch Me). The intent of the special designation program was not to duplicate an existing motto, but to provide units with another opportunity to express a direct association "with some person, place, thing, event, or function having particular significance to the unit [see Chapter 6, AR 870-5 - [PDF - 237KB]." In short, it is a way in which unit personnel and others can refer to the unit. TC 3-21.5 Drill and Ceremonies, January 2012 [PDF - 23MB] This link is provided as a service to units seeking information on conducting activation, inactivation, and other unit ceremonies. Despite the use of the term "deactivation" when describing some ceremonies in the FM, the official Army term is "inactivation." Bombs are deactivated, units are inactivated. Provides a list of U.S. Army units to which decorations were awarded by cobelligerent foreign governments during World War II, together with their accompanying citations. NB:The Force Structure and Unit History Branch does not answer questions concerning the decorations individuals are entitled to wear on their uniforms. Information on which unit decorations are authorized for permanent and temporary wear is contained in Chapter 29, AR 670-1. Information may also be available from your unit or installation personnel (G1/S1) office, or from the Uniform Policy Office within HQDA's Deputy Chief of Staff, G1.